This Speedcuff pouch fits a two inch duty belt and has the option of being in either the vertical or horizontal fixed positions. 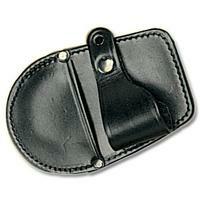 This pouch does not have a swivel the different angles are determined by the way you thread your duty belt. It weighs 129 grams (4 1/2 oz) and has a palm break directional 'dot' fastening.